SORRY, BUT WE ARE NO LONGER TAKING NEW ORDERS FOR THE ERA GT. The facts are clear. 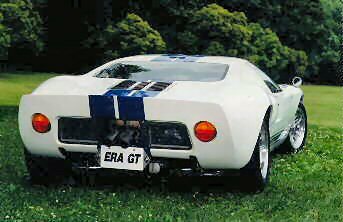 The ERA GT has no equal! Compare our body, engineering, and level of support with others. There is a great deal of information here. If you can't find what you're looking for, please look at the faqs page or the index . It's probably in there! You can also use our text search. But race-car-quality was not enough ! Our body is much straighter than the original, with all-weather sealing - and our chassis is designed for the street as much as the track. Even air conditioning is available. ERA REPLICA AUTOMOBILES has long been known for the highest quality in design, engineering, and craftmenship. In replica circles, the ERA 427SC (and now 289FIA ) have become the standard by which others are judged. In fourteen of the last fifteen years, customer built ERAs have been voted the "BEST COBRA REPLICA" at the annual Shelby American meet! 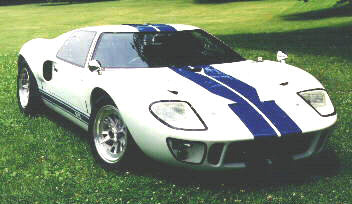 Like the ERA 427SC, the ERA GT kit was designed to be put together like a production car. No fabrication is necessary, so your garage simply becomes the final assembly line. Carefully chosen components are thoroughly integrated into the overall design. All the holes, caged nuts, receptacles, brackets, adapters, etc. that are necessary to mount these components were designed into our kit from the beginning. Except for the drive-train, wheels and some standard suspension components, everything necessaryto complete a finished automobile is there. From a custom aluminum radiator to the minutia of wiring harness clips. Furthermore, the standard pieces are the highest quality . We don't skimp, even where you can't see . All part numbers and likely sources are listed in our comprehensive assembly and service manual . If you don't want to search, E.R.A. offers almost any part you need to finish your car at competitive prices.> We invite comparison with our competitors . Our stainless steel semi- monocoque chassis is second to none, and our body is dead-nuts accurate. We have taken the time to get the details right. We think that you will agree that the E.R.A. GT40 replica is on a higher-quality plane. It is the most visually faithful, with design, construction and ease of assembly available in no other kit. The ERA GT body is an updated version of a mid-60s mid-engined race car, with improvements made for longevity, silence, and weather sealing. Because many of our cars will be used on the street, our standard fiberglass layup is formulated toward maintaining excellent body shaperather than feather-light weight (although custom layups are possible). The front and rear body sections are hand laid using random fiberglass mat so that the paintable surface will show no cloth pattern, even after many years. 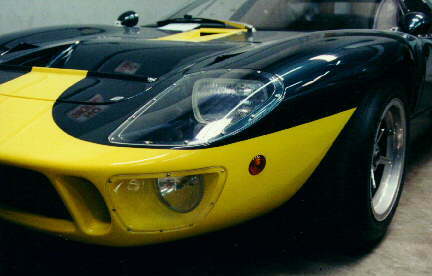 The ERAGT CHASSIS is visually and structurally very similar to the original GT40, but the E.R.A. chassis incorporates many improvements to implement the transition from pure race car to practical street transportation. 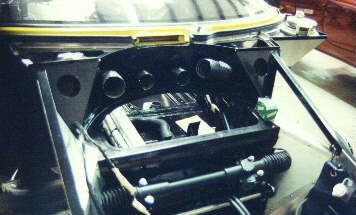 The chassis has been modified to allow left or right hand drive in the basic design. By narrowing the rocker panels slightly, we give you more interior space and comfort . Unlike the original GT40, our chassis is designed for an efficient (optional) air conditioning system. All the components that you must install are simply bolted in. The chassis already has caged nuts for almost everything imaginable. All engine, transaxle, and suspension mounting brackets. Removable access panels for fuel tank, suspension, air ducting, etc. The E.R.A. front suspension has similar geometry and components (updated for wider tires) of a real race car, using E.R.A. manufactured components. Cast aluminum uprights to accept either Corvette integral bearings for bolt-on wheels or ERA's pin drive system. Steering gear adapters and tie rods. All suspension arms and hardware. Cast uprights, ready to accept all components. Nylon lined rod ends and quality spherical joints where appropriate. Like the front, the rear suspension uses E.R.A. manufactured components to re-create the layout of a mid-engine'd race car. The E.R.A. custom aluminum/magnesium alloy uprights accept production axles, bearings and brakes so that servicing is easy and economical. Jig welded trailing arms and lower reversed "A" arms locate the uprights. Compare the configuration of each component with the original. Very few compromises have been made. All wearing components, such as axles, bearings and brake parts are compatible with late model Corvette. When the optional pin-drive wheels are specified, the bearings are modified to accept the E.R.A. pin drive hubs..
Coil-over dampers from Spax, Koni and other sources are optional. A rear sway bar is also available. Except for the rotors and calipers (from late model Corvette), the ERA GT comes with all hydraulic and mechanical parts for the brakes and clutch control systems. From the pedals to the stainless steel sheathed caliper flex lines, everything is included and pre-installed. Fluid reservoirs with fill tubes and brackets are also included. Accelerator pedal assembly, with special progressive linkage. E.R.A. includes a heavy duty custom made aluminum radiator with dual cooling fans for worry free driving. The dual electric fans are thermostatically controlled with a switch in the radiator and can be over-ridden with a dashboard switch. We also include a radiator stone guard and shrouding. Steering wheel, center cap and medallion. Steering column, adjustable for height, and in and out. A complete wiring system , consisting of many plug-together sub-assemblies. The circuit breakers, relays and other components are pre-mounted on a removable bracket so that the most complex components can be wired off the car. It's all plug-in! Because the harness is modular, each body section, dash component and mechanical component is wired separately, and so can be removed easily. Complete wiring harness - a dozen separate modules so that you can wire the front and rear body sections individually - and they can easily be removed later for service. Fuse blocks, flasher and relays on a modular bracket, ready to be mounted in pre-drilled holes on the firewall. 25 page wiring installation manual, with many illustrations and wiring diagram. Headlights, signal/parking lights, and driving lights, pre-installed at the factory. Fuel level sending units, mounted in the fuel cells. Our 110 page manual (plus 25 pages of wiring instructions) carefully and thoroughly guides you through the assembly process,and includes a list of part numbers and sources for all parts. If you can't find a part, E.R.A. usually has it in stock or can give you a reasonable source. If you want to take a look at the text portion, the manual is posted on the web in PDF format, and complete versions are available in hardcopy or PDF format for a refundable fee. Two foam-filled fuel tanks are standard, holding a total of 19 gallons. Made from cross-linked polyethylene, each is extremely impact resistant, especially when you consider it is surrounded by an aluminum cradle and our stainess steel chassis pontoon. All tank fittings, clamps and hoses to the fuel pumps are also included. We also offer an SCCA legal, bladder-type cell in an aluminum case at additional cost. Two aluminum filler caps , with flanges, hoses and intermediate tubes to connect to the fuel tanks. Any small-block Ford engine - 260/289/302/351 will fit, and brackets to mount the alternator are supplied with the kit. The original GT40 ZF 4 bolt transaxle is available again in a stronger 7 bolt version (as used in BMW M1's and Panteras of the mid and late 70's). The transaxles require some modifications (Pantera: ~$800 from ERA, M1: ~$1600 from RBT Transmissions) for use in the ERA GT. Typically, used transaxles sell for $2500-$5000, NOS units to $8000 . While we do not a "deal" in these transaxles, we may be able to give the ERA kit owner some good leads for one. RBT Transmissions (714-516-1215) manufactures new transaxles from the original tooling. A custom bell housing is available to adapt the inverted piece to the engine. The system uses standard Ford clutch parts. A custom throw-out bearing and pilot bushing comes with the bell housing. Your Labor: Expect to spend about 200-300 hours constructing the kit, excluding bodywork and paint. There is no fabrication, but this is a very sophisticated machine - with many exact components. If you want to take a look at the specifics, the manual is posted on the web in PDF format. Our standard kit is not cheap! But $54,900 buys you the beginning of the most extraordinary car you could imagine. E.R.A.also offers many options to make construction of the GT easier. We are also in constant development of new items, so many new items may be available. Custom pieces are also available - we can make almost anything! To reserve a spot in the production schedule, we require a $6000 deposit. This deposit will reserve your kit or turn-key at the agreed upon price. The deposit is fully refundable at any time, up until we actually start production on your kit or turnkey car. It takes about 6 weeks for us to build a kit, 4 months to complete a car. A second payment of 20% of your total cost is required when we actually begin your kit or car. For turn-key cars, some intermediate payments for engine, transaxle and paint may also be required. We prefer for you to deal directly with the people who are doing the work. We make no money on these sublets. The final payment (about 20% of the total) is required on delivery of your vehical. Chassis: Mid-engine stainless steel semi-monocoque with integral rollbar, square tube subframe front and rear. 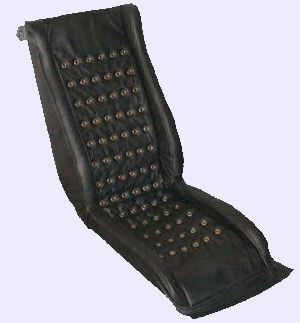 Pin Drive in various sizes from 8" and 9.5" x 15 to 9.5" and 12.5" x 17"
Comfort Adjustable seats, steering wheel and pedal assembly. Will accomodate 6'4" people with "Gurney Bubble"
Questions? Please look through our index and F.A.Q.s sheet! 90% of my e-mail questions are answered in there! Hard copy of this information is available from us, too. See below. You can download a PDF file of the brochure here. Hardcopy of the brochure is also available at the above link, but the web site has much more information. Want to visit? Directions and other information are right here. Check out the CobraCountry web site for other interesting links and our competition! Congratulations to Joe Speziale (#385 427SC) and Bruce Clark ( #2040 ERA GT ) on their wins at the 2000 SAAC! And Jeff Burgy's wins in '99 and 2001! Have an idea for improvements to our site? We're always interested in making it better. Restoration of an original car! 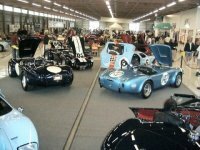 Club Cobra - Mostly Cobra replicas of course, but some discussion of the GT. Information on this site is correct to the fullest extent of our abilities. Era Replica Automobiles assumes no liability for any direct, indirect, incidental or consequential damage resulting from the information within..